(Nanowerk News) Rice University scientists have unveiled a revolutionary new technology that uses nanoparticles to convert solar energy directly into steam. The new “solar steam” method from Rice’s Laboratory for Nanophotonics (LANP) is so effective it can even produce steam from icy cold water. Details of the solar steam method were published online today in ACS Nano ("Solar Vapor Generation Enabled by Nanoparticles"). The technology has an overall energy efficiency of 24 percent. Photovoltaic solar panels, by comparison, typically have an overall energy efficiency around 15 percent. However, the inventors of solar steam said they expect the first uses of the new technology will not be for electricity generation but rather for sanitation and water purification in developing countries. 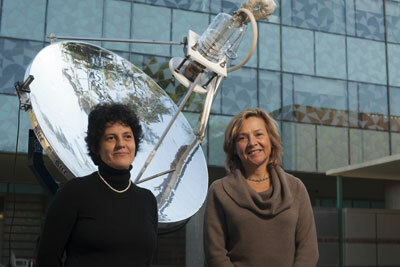 Rice University graduate student Oara Neumann and scientist Naomi Halas. To show just how counterintuitive, Rice graduate student Oara Neumann videotaped a solar steam demonstration in which a test tube of water containing light-activated nanoparticles was submerged into a bath of ice water. Using a lens to concentrate sunlight onto the near-freezing mixture in the tube, Neumann showed she could create steam from nearly frozen water. Steam is one of the world’s most-used industrial fluids. About 90 percent of electricity is produced from steam, and steam is also used to sterilize medical waste and surgical instruments, to prepare food and to purify water. Most industrial steam is produced in large boilers, and Halas said solar steam’s efficiency could allow steam to become economical on a much smaller scale. People in developing countries will be among the first to see the benefits of solar steam. Rice engineering undergraduates have already created a solar steam-powered autoclave that’s capable of sterilizing medical and dental instruments at clinics that lack electricity. Halas also won a Grand Challenges grant from the Bill and Melinda Gates Foundation to create an ultra-small-scale system for treating human waste in areas without sewer systems or electricity. Another potential use could be in powering hybrid air-conditioning and heating systems that run off of sunlight during the day and electricity at night. Halas, Neumann and colleagues have also conducted distillation experiments and found that solar steam is about two-and-a-half times more efficient than existing distillation columns. Halas, the Stanley C. Moore Professor in Electrical and Computer Engineering, professor of physics, professor of chemistry and professor of biomedical engineering, is one of the world’s most-cited chemists. Her lab specializes in creating and studying light-activated particles. One of her creations, gold nanoshells, is the subject of several clinical trials for cancer treatment. For the cancer treatment technology and many other applications, Halas’ team chooses particles that interact with just a few wavelengths of light. For the solar steam project, Halas and Neumann set out to design a particle that would interact with the widest possible spectrum of sunlight energy. Their new nanoparticles are activated by both visible sunlight and shorter wavelengths that humans cannot see.